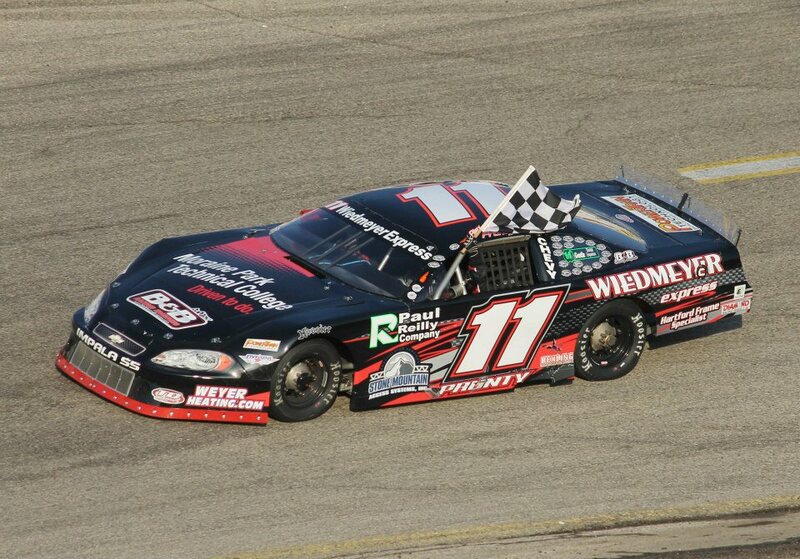 Alex Prunty Racing: Alex Takes Slinger Speedway Opener Win! Alex Takes Slinger Speedway Opener Win! The 2012 season for Alex Prunty was a relative easy one in his mind. 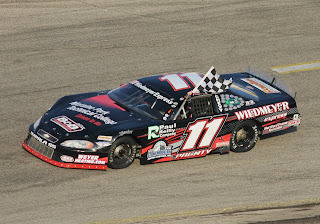 Prunty scored four wins and eleven fast times en route to capturing the season championship in the Late Model Division at the Slinger Super Speedway. He only had one finish outside of the top five all season long. Fast forward to 2013 and the season opener, and for most of the day it looked like Prunty would be as far removed from Victory Lane as you can imagine. Yet when the checkered flag fell it would be Prunty once again in the spotlight, especially after a daring three wide pass for the lead just a few laps from the finish. The cone would come out thanks to a first lap crash in turn three. Justin Poenitsch slammed into the turn three wall and the field would accordion behind him. Several other cars checked up and spun in the melee and suffered what appeared to be only minor damage. Poenitsch was done for the day however. Mike Lichtfeld, Dan Jung, and Alex Prunty took the outside lane at the cone and moved into the top five. Lichtfeld would get the jump as the green flag flew and Jung would follow close on the rear bumper. Ryan Farrell would slip back to third, while Alex Prunty battle Pat McIntee for fourth. Lichtfeld and Jung began to pull away from Farrell, while Ryan DeStefano started a side by side battle with Prunty that saw the duo rubbing through the corners. The yellow would come out again on lap 16 when Brittiny Helmers spun coming off of turn two. No damage done, and she would be able to continue. Jung and Prunty once again took to the outside when the cone appeared, and were joined by John DeAngelis, Brad Dahmer, and Jesse Bernhagen. Lichtfeld would take off when the green came out, but the field would be slowed a lap later. Ryan Farrell brought out the yellow with a flat right front tire that bottled up the field behind him. This time it would be Jung, DeStefano, Danny Church, and Bernhagen that took to the outside with the cone, although Lichtfeld would get out to the lead once again. Initially he couldn’t shake Jung off his rear bumper, but ever so slowly he began to stretch out his lead. That lead would become 3-5 car lengths before disaster was almost imminent. There is an adage in racing that a car tends to run its best and fastest right before it blows up. Perhaps that was true for Mike Lichtfeld as suddenly on lap 29 his car showed the tell tale signs of dropping a cylinder. Yet that didn’t seem to deter Lichtfeld, as he continued to somehow stay in front for several laps. Dan Jung smelled the blood in the water as he moved in closer to Lichtfeld. On lap 33 Jung would get under Lichtfeld for the lead and bring Prunty along into second. However, Lichtfeld would not let one ailing cylinder stop him from racing hard. The trio continued to battle for the lead as the laps wound down. With Jung on the high side and Lichtfeld in the middle, Prunty made a bold move to the deep inside coming off of turn four going three wide and grabbed the lead. Prunty would clear Jung a lap later and narrowly held on for the win. Lichtfeld and his sick motor managed to squeak past Jung at the line to finish second. Danny Church and Ryan DeStefano rounded out the top five. Prunty was incredulous that he managed to get the win, and didn’t even realize he had to go three wide to do it. It was a crazy battle indeed, but for Mike Lichtfeld it was more of a story about the one that got away. Especially since he had won two of his three previous races at Slinger. Two wins and two seconds in four races definitely has Lichtfeld excited for this season.